If you don’t like muffins, you have no idea what you’re missing… yet. This little recipe and the amount of chocolate that goes into it, will turn you into a fan in no time. It is very easy to make and requires just few simple ingredients. Preheat the oven to 375° F / 190° C. Grab a large bowl and add to it the flour, baking soda, baking powder, sugar, cocoa powder, salt and chocolate chips. In a medium bowl, add milk, oil, egg and vanilla extract. Now mix everything together really well, both dry and wet ingredients. Using a small size muffin tray, fill up 12 paper liners. Bake them for 20 or 25 minutes and then enjoy these puppies. 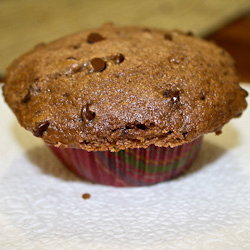 Preheat oven to 375° F / 190° C. Grease and flour your muffin pans, or use paper liners instead. In a large bowl, combine flour, baking powder, salt, baking soda, cocoa powder, sugar and chocolate chips. In another bowl whisk the wet ingredients, the milk, vegetable oil, egg, and vanilla extract. Add the wet ingredients into the dry ingredients and mix well. Spoon the mixture into the muffin pan. Bake for 20-25 minutes or until baked through. You can test it by sticking a toothpick into a muffin and it should come out clean.